What are the pros and cons of HubSpot? We looked, but there’s very little if at all that we can say against the applications created by HubSpot. The following thoughts explain why. HubSpot is widely acclaimed for creating such successful marketing, sales, CRM tools and customer service solutions that work excellently not only individually but also as a duo or as a complete set package. Of course by now it’s no secret what impressive returns CRM software, sales, marketing and customer support solutions can generate working synergistically together. HubSpot, however, saw this early, enabling it to launch applications that have more compelling appeal—and actual value—when they are made to work in an organic ecosystem of processes and ideas that deliver the ultimate objectives of companies: sustained returns, deeply loyal customers, complemented by products and designs with mass pull. In optimizing marketing and sales campaigns, for example, this symbiotic CRM-sales-marketing merging has catapulted response rates beyond the typical rate of 3% to upwards of 15% or higher. The figure for integration of marketing and CRM is also quite impressive: relying on marketing automation brings an average of 451% increase in qualified leads, greatly informing marketers about those factors that effectively apply to nurturing each lead. But going back to HubSpot: while we already said that their solutions are well-received in the market, we could safely assume that nothing is too perfect in this world—so before we delve into the pros and cons of HubSpot, let’s go back to the features that made their systems as dominant as they are. Additionally, you may check out how HubSpot compares to other solutions, for example Salesforce vs. HubSpot CRM. Founded in 2006, HubSpot is the company behind the largely successful software for marketing, sales and customer service powered by a completely free CRM at their core. HubSpot CRM is a completely free implementation of a customer relationship management platform noted for its powerful features that enable customers to relate stronger with their customers, boost conversations, and improve revenues based on multiple interaction channels. The remarkable nature of this HubSpot cost understandably raised a few eyebrows upon its launch, but there really need not be any mystery to it, as HubSpot generates a lot of goodwill and many upselling and cross-selling deals with this move. HubSpot Marketing is an advanced marketing system that focuses on helping companies grow traffic and increase conversions through stunning landing pages, customizable workflows, content editing, and great distribution outreach. HubSpot Sales is an intelligent ecommerce system that offers powerful features so customers can sell more in less time while seamlessly automating those processes for more efficient sales operations. The vendor is offering the CRM platform for free forever, a great reason to try out the key features at no cost. You can easily sign up for HubSpot CRM free trial here. Our inquiry into the pros and cons of HubSpot finally brings us to the main section. We group entries based on common elements and from individual applications’ point of view. A fully analyzable synergy. HubSpot Marketing can be connected to HubSpot CRM or Salesforce to ensure that all customer interactions with your brand are recorded and examined. With all meaningful data packed in one place, you can pull off accurate and confident reports, while gaining insight about how each of your campaigns is affecting your sales. Access and link anywhere, anytime. You can access and link all three HubSpot solutions to all places and locations where your crucial processes are taking place, including your websites, email service providers, social media profiles, phone calls, and more. Outstanding support. HubSpot is justifiably acclaimed for its excellent support. The staff are always knowledgeable, friendly, and consistently available via phone, email, or live chat. HubSpot also offers plenty of guides and training materials, with a large user community where you can ask for help or share your experience. It’s as powerful as the paid CRMs out there, it’s free from the start and still absolutely free until now. It did manage to raise a few eyebrows upon launch with its nonexistent price scheme, but it turns out HubSpot was a genius move for the way it earns its maker plaudits and tons of goodwill, translating to multiple chances of upselling and cross-selling not only for HubSpot itself but also for its myriad third-party partners. 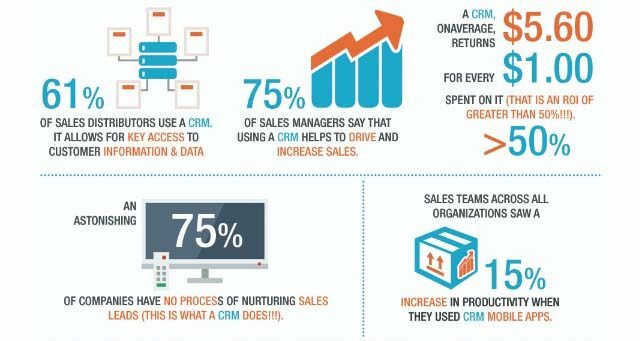 What’s a CRM if not to provide crucial information about your customers that you can turn into leads and ultimately coffer revenues? HubSpot CRM does just this in spades, tracking customer interactions automatically, providing valuable insights into customer behavior, intimate information that allows you the best way to do your follow-ups. Most CRMs have annoying customization limits, but HubSpot lets you to customize everything to your brand and your specific sales process. Once installed, HubSpot CRM will run in the background of all tools you are already using, and you will be able to trigger it whenever you need it. The list of available integrations is very long, including such names as Pipedrive CRM, SugarCRM, Bigcommerce, Gravity Forms, Base CRM, Google Chrome, Google Dynamics, Snapengage, Dropbox, and many more (see the integrations tab above for a full list). Simply put, HubSpot CRM is comfortable in any software ecosystem, blending easily with multiple processes and operations instead of asking you to modify those. 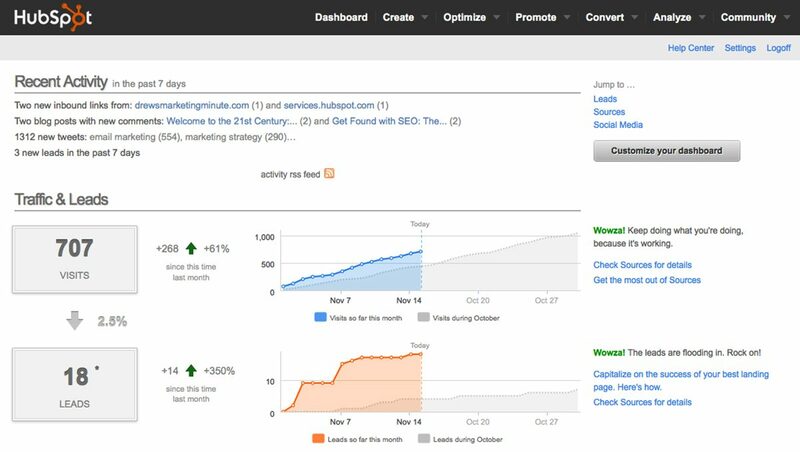 HubSpot presents all your data from your email marketing campaigns, social media engagements, and landing page visits by logging on the same dashboard—a powerful, convenient feature that eliminates the tedious and confusing setup of having to log in to different accounts for each category. Not having one dashboard to manage all these makes everything inefficient. You will most likely waste a lot of time trying to keep track of all your data.  HubSpot has a huge repository of easy-to-use templates to support any website design needs, email drip campaigns, e-books, case studies and more. If you have an excellent in-house designer, this feature saves you a lot of trouble in the long run conceptualizing from scratch. If you don’t have an in-house designer, you will probably need to hire a design expert to optimize the library potential and not turn it into a waste of unused feature in your subscription. HubSpot’s marketing automation allows users to design their own workflows, prepare, format, and publish content, and seamlessly integrate contact profiles and information to make the most of their campaigns. A familiar environment servers as a convenient launchpad to segment, nurture, and evaluate leads in a more flexible way. HubSpot’s social media tool allows marketers to manage, publish and monitor all our social media accounts from a single dashboard. To keep things interesting, you could have HubSpot show your competition’s social media metrics and what prospects are saying about your brand, other brands, the industry, and anything else you want to monitor. This powerful feature makes for an argument that this functionality alone justifies the purchase of HubSpot. Other social media tools simply don’t have this kind of monitoring functionality to them, and neither as robust analytics as HubSpot has. HubSpot’s social media tool simply does so much more. In order to make the most of HubSpot Marketing, you’d probably feel the need to avail of some training in that direction. For that, HubSpot provides excellent modules, with trainers who are some of the most helpful people around. The classroom training is always first-rate—and inexpensive. If you are enrolling a group of your employees, you can also negotiate discounted rates—never mind the figures posted on their website. And as bonus, you get your hands on all the requisite materials and classroom content. HubSpot Marketing’s landing page builder is an easy-to-use, drag-and-drop tool that requires no coding skills to create beautiful websites. Its SEO optimization tools allows you to distribute catchy and effective content and manage the way how leads interact with it from a single, dynamic dashboard. HubSpot Sales enables you to easily automate outreach, and queue up a sequence of personalized emails without risking to communicate with leads in an impersonal way. All due reminders are delivered automatically, including those sent to you whenever a prospect performs the desired action (opens an email, clicks on a link, and so on). With HubSpot sales, you can create your own personalized email templates and use them to measure performance. The system makes it possible to add meeting links to each email, so that your customers wouldn’t miss your calls or fail to open your emails, but rather contact you in a time that is most suitable for them. HubSpot Sales enables you to keep a close eye on your customers’ behavior. Once all data is entered in the system, you start receiving notifications each time your prospects open their emails, or once they’ve clicked on a link or an attachment. The system will also score them on your behalf and make sure the hottest leads are kept in the loop. HubSpot Sales eliminates manual data entry in several ways. You can import your contact bases and have them displayed on your dynamic dashboard, or have critical metrics such as location, contact info, and clicks logged automatically whenever a customer opens an email. If you’re also using HubSpot’s inbound marketing suite, you can also ask visitors to fill a specific contact form, and focus on what is genuinely important for them—closing deals. HubSpot Sales will not only help you manage current deals but also drive interest your way. You will have clear picture of where to promote your products or services, and who’d be most interested in them. This information derives from monitoring who’s visiting and what they’re looking for, so that no prospective buyer would slide through the cracks. What are some weaknesses of HubSpot? While we have covered several positives of HubSpot, we need to point out something that you have to be on guard as you try to engage more of its advanced capabilities to expand your business. Specifically, you’ll want to make sure your expanding number of leads does not work against you at some point. Why? Because as you are aware, the cost of your marketing and sales plans would mostly depend on the number of your contacts that you want to ultimately convert into paying patrons in the end. If your number of contacts is disproportionately populated by virtually dead leads, you would do well to clean up your database if you don’t want ballooning subscription for no particular reason other than to hurt your ROI. You absolutely do not want that. HubSpot charges a graded premium beyond certain numbers and you could be wasting funds on the side at the same time that you are only looking at the positive returns. Sales and marketing is indeed a numbers game, but you’ll want to make sure your numbers are particularly better than the others. All in all, HubSpot is a great set of tools, and sice the basic package works great with a free plan you should definitely give it a try. You can easily sign up for HubSpot CRM free trial here.